Frugal Blog: The Sheep Are Keeping My Kitchen Warm! The Sheep Are Keeping My Kitchen Warm! Amidst our current trials (and errors) of calculating the costs involved in heating an old cottage in a rural Scottish village, we have reached the next step of our renovation journey. As can be expected, the good old Scottish weather has dictated the order of things, so it was with some dismay that we had to endure the full blast of last week's 'hurricane' with the wind whistling through the old back door at the same time as having no ceiling in the kitchen. Any attempt to heat the place was pointless. 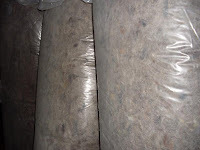 But the insulation had arrived - six rolls of Black Mountain sheep wool. We opted to purchase this from a company called Natural Insulations and I have to say, their service was faultless. The half pallet of insulation arrived at the door within a couple of days and the delivery company kept us informed as to exactly when they would arrive. I even kept the pallet as extra firewood. This has been one of my 'luxury buys' for the Frugaldom household, as the budget wouldn't normally stretch that far. Attempting to be environmentally friendly, however, is something that we want to do here, despite all odds associated with frugal living. There is little (or no) incetive for households on a tight budget to incorporate enviromentally friendly, carbon neutral products into any renovation or improvement projects, so some financial jiggery pokery had to be done, along with a money making challenge to help increase the income last month. 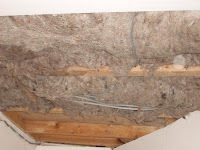 Fortunately, that goal was achieved and I wasn't forced to settle for cheap, nasty, subsidised glass fibre insulation. Being in the unfortunate situation that our roof had to be replaced without removing it in its entirety (owing to adverse weather conditions) the joiners were faced with the task of then renewing the ceiling while incorporating insulation from the uderside, rather than being able to simply lay it between rafters. 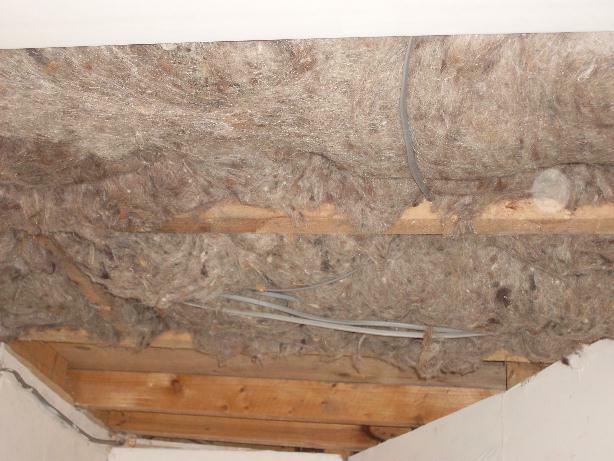 To be fair, they had expected me to opt for insulation boards such as Celotex or Kingspan, so this was a first encounter with sheep wool for them. Work began this morning with the arrival of the electrician to rewire the kitchen, followed shortly by the joiners, complete with the foil backed plasterboard and other necessary bits and pieces. The insulation was at the ready and I have now been informed that it is excellent to work with, when comparing it to standard glass fibre. Aside from the fact that the joiner currently looks a bit like a yeti, where his fleece has attracted the other fleece, he has suffered no irritation from the product whatsoever. 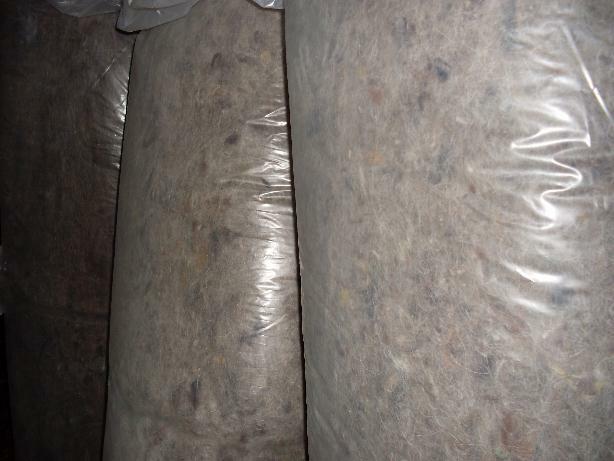 The Black Mountain sheep wool insulation at 100mm thickness offers a thermal conductivity of 0.039 W/m².K. It is 95% natural wool fibre, created from the fleeces of Swaledales and Welsh Black Face sheep. It is a truly sustainable product, easy to handle, cut and shape, has an ozone depletion potential of zero, locks away carbon and even feels warm to the touch. It can absorb up to 35% moisture without its insulating properties being affected, so that's a definite bonus in a well used kitchen. (Technical data can be found here.) And the cat loves it! The kitchen is progressing well, with most of the rewiring completed and the new ceiling now being fitted to incorporate all this lovely insulation. I've double checked to ensure cables are double-insulated and they've all been tested to ensure there's no possibility of any heat radiating that could create any fire hazard and the plasterboard is now going up, adding an extra barrier by way of the foil-backing. You can already feel the difference in the temperature of the kitchen, despite it blowing a gale outside at the moment, and that's just the first half of the ceiling done. My initial comparison had been done on the chance that we would have had to use Celotex or Kingspan type insulation board, but further research proved that this board would have cost around 20% more than us having had the sheep wool delivered to Scotland from Wales, so there has been some small saving, enough to cover the cost of the foil-backed plasterboard! There has not been a great deal of extra expense incurred by 'going green' on this issue. All in all, I'm very optimistic about the quality and capabilities of this product and very pleased that the decision was made to go the most environmentally friendly route available to us. The electrician has to return and finish wiring in the lights, the ceiling needs fitted in the back hallway, where sheep wool has also been added, and then there's plenty more to do after that. 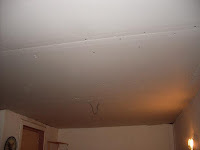 But we have the long-awaited, insulated kitchen ceiling, just in time for winter setting in properly. There's money saving and then there' money saving - the sheep wool won't need to be topped up or replaced every 10 years, for a start, and I have the rest of the winter to calculate what savings can be made in keeping at least one room of the house warm until we've saved enough to start on the next one. In addition to the above, we also had the back door and framework replaced, so no more wind whistling through that! On completion of the kitchen, this will be the first part of the house to be insulated, so the challenge is on to save enough to invest in more sheep wool for the rest of the house, both upstairs and down. The frugal renovation project continues with the replacement of the kitchen window, which was held up by it not being made in time for the joiner's visit this week. The joys of Listed buildings and their 'like for like' modernisation policies, everything new needs to be made the same size and shape as the old, but I guess that's what I like about old buildings - they have traditional character. It looks fab and is doing its job already....great stuff! Very pleased for you, at last, a warm, dry kitchen to work in. Should notice a huge difference, more so when the window is finally changed over. I wouldn't go as far as to call the kitchen warm just yet, as the draughty old window is still in situ and we have gale force winds battering straight into it at the moment - very draughty and cold! It's also sending all the bits of loose sheep wool billowing about the kitchen! LOL For whatever reason, the wind seems much stronger now than it was during last week's 'hurricane' yet I haven't see or heard any red warnings, only a yellow one earlier today.